This morning, while perusing Twitter, I discovered that today is National Pancake Day, when, most notably, one can go into any participating IHOP restaurant and get a short stack of pancakes for free. The the last time I remember “celebrating” National Pancake Day, I was about 19 years old and accompanied by at least 10 other broke college students in the Boston area’s only IHOP, way out on Soldier’s Road in Brighton. It’s within the realm of possibility that we were not entirely sober upon consumption of our complementary flapjacks, and it is certain that we severely annoyed our server. Now that I’m much more grown up (ha! 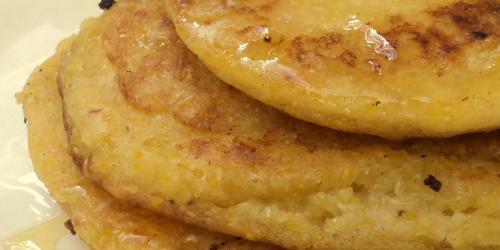 ), I enjoy these sophisticated cornmeal pancakes at home. Serve with butter and honey, or get creative and add fruit, jams or even black pepper. 1 cup medium or fine cornmeal $3 for 16 oz. Put the cornmeal in a bowl. Bring 1 cup of water to a boil and pour it over the cornmeal. Stir in and let sit for 5 minutes, until soft. Whisk in the milk, salt, flour and melted butter. Heat a thin layer of oil in a medium frying pan over medium-hight heat. Pour the pancakes in 1/4 cup increments into the oil (you’ll need to work in batches), and cook until the bottoms are golden-brown and the tops begin to bubble. Flip pancakes and cook on the other side until golden-brown. Serve the pancakes hot with more butter, if desired, and a drizzle of honey. Mmm, I think I’ve found a solution to my laziness and my persistent craving for arepas de choclo and homemade waffles. This should satisfy both cravings easily, yum! you can get you research paper on hotel management with deep research by our expert writers. Positive site, where did u think of the data on this posting? I’m satisfied I found it however, sick be inquiring soon to figure out what extra posts you incorporate. I can’t envision concentrating sufficiently long to research; considerably less compose this sort of article. You’ve beaten yourself with this material. This is incredible substance. When you sit down to write a blog put up your blog is already formatted and laid out a sure way. That leaves you with a few selections to make in how you layout your blog posts. To layout a great blog publish it’s far essential to consider how you need your put up to appearance.